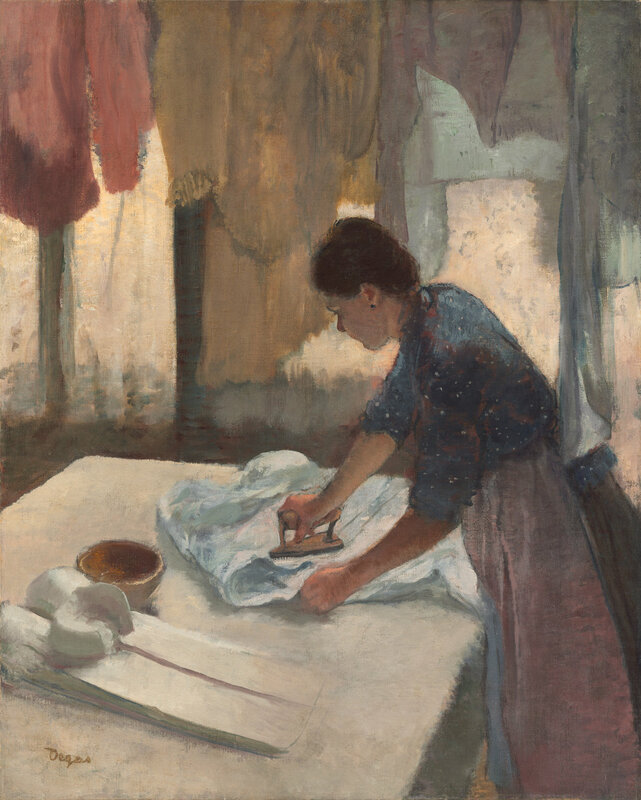 Edgar Degas, “Woman Ironing.” oil on canvas, begun c. 1876, completed c. 1887. Collection of Mr. and Mrs. Paul Mellon, National Gallery of Art, Washington, DC. her feet swell with fluid. for the moment when she begins. and bends to the basket. as the iron tips forward. as steam rises from cotton. This poem was published March, 2013 at YourDailyPoem. Gail Gopfert owns the copyright. About the poem: Balla says that the poem is well-structured. It begins with a strong image that pulls the reader into the poem. There are other excellent images also. She liked the contrast between ironing out wrinkles and ironing in creases. The verbs are active. She thinks the poem does a good job of picturing how things often have been for women, especially in earlier generations. The ending brings the reader back to the title: What does the woman see with her mind’s eye? What is she reckoning? Camille A. Balla, resides in a western suburb of Chicago where several of her poems have been inspired from the view outside her window or from her walks along the trails. Many of her poems have appeared in local and national publications, some of which have been published as greeting cards and gift items. In 2010, Camille published Simple Awakenings, a chapbook of poetry that lifts the ordinary into a delightful experience. Thank you to everyone who entered the November Poetry Challenge. Look for a new challenge on December 1.